The Four Deserts Route covers the entire southern area of Namibia, from the Orange River up to the Tropic of Capricorn. 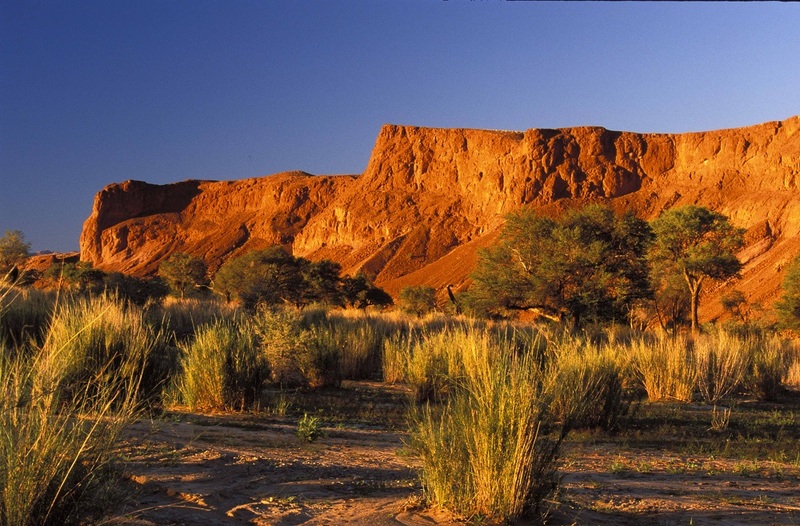 Namibia boasts four great and very different desert systems. It comes as a surprise for some that desert landscapes are not just endless stretches of sand but may be rocky and mountainous as well, at times punctuated with vast gravel plains. In the east lie the deep, red sands of the Kalahari Desert. With a total area of 1.6-million km², it is the largest continuous stretch of sand in the world. The long, parallel dunes were formed about 20 000 years ago and are partly covered with grasses, punctuated by gnarled old camelthorn trees and shepherd’s bush. Game manages to survive by means of special adaptations, and large herds of oryx, springbok and ostrich are once more moving across the landscape, followed by increasing numbers of vultures, marabou storks and other scavengers. The Kalahari is the home of the San Bushmen, people who have been able to live so frugally from these resources, perfecting the art of sustainable living. The Nama Karoo covers most of southern central Namibia, driving a deep wedge northwards of the Orange River (and South Africa) to about 120km south of Windhoek, with a narrow strip along the edge of the Namib reaching up to Angola. The sedimentary geological formations take on dramatic proportions in the Fish River Canyon, the second-largest canyon on Earth, formed during the break-up of Gondwanaland some 130-million years ago. Various hikes and drives afford one an opportunity to view the increasing herds of springbok, and also of oryx, kudu, mountain zebra and ostrich. 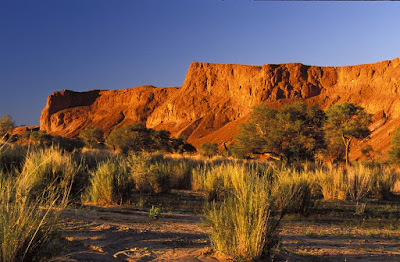 Much of the Nama Karoo consists of wide plains, broken only by the dark, enigmatic massif of Brukkaros Mountain, some 120km north of Keetmanshoop. Perhaps it was the tranquillity of this huge desert that inspired the construction of a fairytale castle in the midst of this landscape at Duwiseb, to the west, a century ago. Situated at Aus and extending southwards, the Succulent Karoo is mainly a winter-rainfall area. Bizarre-looking shrubs store moisture in their leaves and stems to tide them over the dry times. The Succulent Karoo is the most plant-diverse desert in the world and has been listed as one of the world’s 25 global biodiversity 'hotspots'. Although these floral wonders are at their best after the rains, they are well worth investigating throughout the year. Lüderitz provides a fascinating breakaway, its harsh, minimalistic landscape resembling that of an island. In the vicinity one can hear and see African penguins as they go about their activities, and on a visit to the ghost diamond mining town of Kolmanskop one wonders at the lives of the past inhabitants of this desert settlement. To the north, the Namib Desert lies in a narrow strip along the Atlantic Ocean. The scenery ranges from shifting, glowing red dunes in the south to gravel plains with inselbergs in the central parts, and jagged blue mountains in the north and east, with deep valleys cut by ephemeral rivers. Fog supplies the life-giving moisture for plants and animals. Here, visitors have a wide range of experiences to choose from: clambering up some of the highest sand dunes in the world at Sossusvlei at dawn; discovering the ancient, fossilised red dunes south of Solitaire as they stand frozen in time; gazing at huge black lappetfaced vultures as they arch across the sky; or following in the tracks of a solitary oryx across the gravel plains. One of the ultimate ways of experiencing this desert is to drift by balloon over the endless red dunes in the early morning sun.